"Southern Drawl" redirects here. For the album by Alabama, see Southern Drawl (album). This article is about English as spoken in the Southern United States. For older English dialects spoken in this same region, see Older Southern American English. For English as spoken in South America, see South American English. Southern American English or Southern U.S. English, is a regional dialect or collection of dialects, of American English spoken throughout the Southern United States, though increasingly in more rural areas and primarily by White Americans. The dialect is commonly known in the United States simply as Southern, while formal, much more recent terms within American linguistics include Southern White Vernacular English and Rural White Southern English. A regional Southern American English consolidated and expanded throughout all the traditional Southern States since the last quarter of the nineteenth century until around World War II, largely superseding the older Southern American English dialects. With this younger and more unified pronunciation system, Southern American English now comprises the largest American regional accent group by number of speakers. As of 2006, a Southern accent is strongly reported throughout the U.S. states of North Carolina, South Carolina, Georgia, Alabama, Mississippi, Tennessee, Arkansas, Louisiana, and Kentucky, as well as most of Texas, eastern and southern Oklahoma, southern Missouri, southeastern Maryland, Virginia, West Virginia, northern Florida, and southeastern New Mexico. The accent of some Midland American English (often identified as a South Midland accent) is documented as sharing key features with Southern American English, though to a weaker extent, including in northern Oklahoma, eastern and central Kansas, Missouri generally, the southern halves of Illinois and Indiana, southern Ohio, western Delaware, and south-central Pennsylvania. Southern American English as a regional dialect can be divided into various sub-dialects, the most phonologically advanced (i.e., the most innovative) ones being southern varieties of Appalachian English and certain varieties of Texan English. African-American English has many common points with Southern American English dialects due to the strong historical ties of African Americans to the South. Recently, the Southern accent has been receding among younger and more urban Southerners. An example of a Texas-raised male with a rhotic accent (George W. Bush). An example of a Plains, Georgia male with a non-rhotic accent (Jimmy Carter). An example of a southwestern Arkansas male with a rhotic accent (Bill Clinton). The dialects collectively known as Southern American English stretch across the south-eastern and south-central United States, but exclude the southernmost areas of Florida and the extreme western and south-western parts of Texas as well as the Rio Grande Valley (Laredo to Brownsville). This linguistic region includes Alabama, Georgia, Tennessee, Mississippi, North Carolina, South Carolina, Louisiana, and Arkansas, as well as most of Texas, Virginia, Kentucky, Oklahoma, West Virginia, and northern and central Florida. Southern American English dialects can also be found in extreme southern parts of Missouri, Maryland, Delaware, and Illinois. Southern dialects originated mostly from a mix of immigrants from the British Isles, who moved to the American South in the 17th and 18th centuries with minor African elements introduced by African Slaves brought to the region. Upheavals such as the Great Depression, the Dust Bowl and World War II caused mass migrations of those and other settlers throughout the United States. The approximate extent of Southern American English, based upon The Atlas of North American English. Most of the Southern United States underwent several major sound changes from the beginning to the middle of the twentieth century, during which a more unified, region-wide sound system developed, markedly different from the sound systems of the nineteenth-century Southern dialects. Southern Vowel Shift (or Southern Shift): A chain shift regarding vowels is fully completed, or occurring, in most Southern dialects, especially younger ones, and at the most advanced stage in the "Inland South" (i.e. away from the coastline) and "Texas South" (i.e. most of central and northern Texas). This 3-stage chain movement of vowels, called the Southern Shift, is first triggered by Stage 1 that dominates the entire Southern region, followed by Stage 2 that covers almost all of that area, and Stage 3 that is concentrated only in speakers of certain core sub-regions. Stage 1 (defined below) may have begun in some Southern dialects as early as the first half of the 1800s with a glide weakening of /aɪ/ to [aɛ] or [aə]; however, it was still largely incomplete or absent in the mid-1800s, before expanding rapidly from the last quarter of the 1800s into the middle 1900s; today, this glide weakening or even total glide deletion is the pronunciation norm throughout all of the Southern United States. listen), so that, for example, the word ride commonly approaches a sound that most other American English speakers would hear as rod or rad. Stage 1 is now complete for a majority of Southern dialects. Southern speakers particularly exhibit the Stage 1 shift at the ends of words and before voiced consonants, but often not before voiceless consonants, where the diphthong instead retains its glide, so that ride is [ɹäːd], but right is [ɹäɪt]. Inland (i.e. non-coastal) Southern speakers, however, indeed delete the glide of /aɪ/ in all contexts, as in the stereotyped pronunciation "nahs whaht rahss" for nice white rice; these most shift-advanced speakers are largely found today in an Appalachian area that comprises eastern Tennessee, western North Carolina and northern Alabama, as well as in central Texas. Some traditional East Coast Southern accents do not exhibit this Stage 1 glide deletion, particularly in Charleston, SC and possibly Atlanta and Savannah, GA (cities that are, at best, considered marginal to the modern Southern dialect region). This new glideless [aː~äː] vowel encroaches on the territory of the "short a" vowel, /æ/ (as in rat or bad), thus pushing /æ/ generally higher and fronter in the mouth (and also possibly giving it a complex gliding quality, often starting higher and then gliding lower); thus /æ/ can range variously away from its original position: [æ(j)ə~æɛæ~ɛ(j)ə>ɛ]. An example is that, to other English speakers, the Southern pronunciation of yap sounds something like yeah-up. listen) or to an even lower and/or more retracted sound. At the same time, the pushing of /æ/ into the vicinity of /ɛ/ (as in red or belt), forces /ɛ/ itself into a higher and fronter position, occupying the [e] area (previously the vicinity of /eɪ/). /ɛ/ also often acquires an in-glide: thus, [e(j)ə]. An example is that, to other English speakers, the Southern pronunciation of yep sounds something like yay-up. Stage 2 is most common in heavily stressed syllables. Southern accents originating from cities that formerly had the greatest influence and wealth in the South (Richmond, VA; Charleston, SC; Atlanta, Macon, and Savannah, GA; and all of Florida) do not traditionally participate in Stage 2. Stage 3 (/iː/ → [ɪi] and /ɪ/ → [iə]): By the same pushing and pulling domino effects described above, /ɪ/ (as in hit or lick) and /i/ (as in beam or meet) follow suit by both possibly becoming diphthongs whose nuclei switch positions. /ɪ/ may be pushed into a diphthong with a raised beginning, [iə], while /iː/ may be pulled into a diphthong with a lowered beginning, [ɪi]. An example is that, to other English speakers, the Southern pronunciation of fin sounds something like fee-in, while meal sounds something like mih-eel. Like the other stages of the Southern shift, Stage 3 is most common in heavily stressed syllables and particularly among Inland Southern speakers. Southern vowel breaking ("Southern drawl"): All three stages of the Southern Shift often result in the short front pure vowels being "broken" into gliding vowels, making one-syllable words like pet and pit sound as if they might have two syllables (as something like pay-it and pee-it respectively). This short front vowel gliding phenomenon is popularly recognized as the "Southern drawl". The "short a", "short e", and "short i" vowels are all affected, developing a glide up from their original starting position to [j], and then often back down to a schwa vowel: /æ/ → [æjə~ɛjə]; /ɛ/ → [ɛjə~ejə]; and /ɪ/ → [ɪjə~ijə], respectively. This phenomenon is on the decline, being most typical of Southern speakers born before 1960, though mostly after the mid-1800s. Unstressed, word-final /ŋ/ → [n]: The phoneme /ŋ/ in an unstressed syllable at the end of a word fronts to [n], so that singing /ˈsɪŋɪŋ/ is sometimes written phonetically as singin [ˈsɪŋɪn]. This is common in vernacular English dialects around the world. Lacking or transitioning cot–caught merger: The historical distinction between the two vowels sounds /ɔː/ and /ɒ/, in words like caught and cot or stalk and stock is mainly preserved. In much of the South during the 1900s, there was a trend to lower the vowel found in words like stalk and caught, often with an upglide, so that the most common result today is the gliding vowel [ɑɒ]. However, the cot–caught merger is becoming increasingly common throughout the United States, thus affecting Southeastern and even some Southern dialects, towards a merged vowel [ɑː]. In the South, this merger, or a transition towards this merger, is especially documented in central, northern, and (particularly) western Texas. Pin-pen merger: the vowels [ɛ] and [ɪ] now merge when before nasal consonants, so that pen and pin, for instance, or hem and him, are pronounced the same, as pin or him, respectively. The merger, towards the sound [ɪ], is still unreported among some vestigial varieties of the older South, and other geographically Southern U.S. varieties that have eluded the Southern Vowel Shift, such as the Yat dialect of New Orleans or the anomalous dialect of Savannah, Georgia. Rhoticity: The "dropping" of the r sound after vowels was historically widespread in the South, particularly in former plantation area. This phenomenon, non-rhoticity, was considered prestigious before World War II, after which the social perception in the South reversed. Now, rhoticity (sometimes called r-fulness), in which all r sounds are pronounced, is dominant throughout the entire South, and even "hyper-rhoticity", particularly among younger and female white Southerners; the only major exception is among African American Southerners, whose modern vernacular dialect continues to be mostly non-rhotic. The sound quality of the Southern r is the distinctive "bunch-tongued r", produced by strongly constricting the root or midsection of the tongue, or both. Lax and tense vowels often neutralize before /l/, making pairs like feel/fill and fail/fell homophones for speakers in some areas of the South. Some speakers may distinguish between the two sets of words by reversing the normal vowel sound, e.g., feel in Southern may sound like fill, and vice versa. The back vowel /uː/ (in goose or true) is fronted in the mouth to the vicinity of [ʉː] or even farther forward, which is then followed by a slight gliding quality; different gliding qualities have been reported, including both backward and (especially in the eastern half of the South) forward glides. The vowel /ʌ/, as in bug, luck, strut, etc., is realized as [ɜ], occasionally fronted to [ɛ̈] or raised in the mouth to [ə]. In former plantation areas, a more backed form, [ʌ], is common among older speakers. /z/ becomes [d] before /n/, for example [ˈwʌdn̩t] wasn't, [ˈbɪdnɪs] business, but hasn't may keep the [z] to avoid merging with hadn't. Many nouns are stressed on the first syllable that are stressed on the second syllable in most other American accents. These may include police, cement, Detroit, Thanksgiving, insurance, behind, display, hotel, motel, recycle, TV, guitar, July, and umbrella. Today, younger Southerners tend to keep this initial stress for a more reduced set of words, perhaps including only insurance, defense, Thanksgiving, and umbrella. Florida is typically pronounced /ˈflɑːrɪdə/ rather than General American /ˈflɔːrɪdə/, and lawyer is /ˈlɔːjər/ rather than General American /ˈlɔɪər/ (i.e., the first syllable of lawyer sounds like law, not loy). The /deɪ/ in words like Monday and Sunday is commonly /di/. Spigot (a water tap) is often pronounced /ˈspɪkət/, as if spelled spicket. Lacking or incomplete happy tensing: The tensing of unstressed, word-final /ɪ/ (the second vowel sound in words like happy, money, Chelsea, etc.) to a higher and fronter vowel like [i] is typical throughout the United States, except in the South. The South maintains a sound not obviously tensed: [ɪ] or [ɪ~i]. Words ending in unstressed /oʊ/ (especially with the spelling ⟨ow⟩) may be pronounced as /ə/ or /ʊ/, making yellow sound like yella or tomorrow like tomorra. William Labov et al. identify the "Inland South" as a large linguistic sub-region of the South located mostly in southern Appalachia (specifically naming the cities of Greenville SC, Asheville NC, Knoxville and Chattanooga TN, and Birmingham and Linden AL), inland from both the Gulf and Atlantic Coasts, and the originating region of the Southern Vowel Shift. The Inland South, along with the "Texas South" (an urban core of central Texas: Dallas, Lubbock, Odessa, and San Antonio) are considered the two major locations in which the Southern regional sound system is the most highly developed, and therefore the core areas of the current-day South as a dialect region. The accents of Texas are actually diverse, for example with important Spanish influences on its vocabulary; however, much of the state is still an unambiguous region of modern rhotic Southern speech, strongest in the cities of Dallas, Lubbock, Odessa, and San Antonio, which all firmly demonstrate the first stage of the Southern Shift, if not also further stages of the shift. Texan cities that are noticeably "non-Southern" dialectally are Abilene and Austin; only marginally Southern are Houston, El Paso, and Corpus Christi. In western and northern Texas, the cot–caught merger is very close to completed. Some sub-regions of the South, and perhaps even a majority of the biggest cities, are showing a gradual shift away from the Southern accent since the second half of the twentieth century to the present. Such well-studied cities include Houston, Texas, and Raleigh, North Carolina; in Raleigh, for example, this retreat from the accent appears to have begun around 1950. Other sub-regions are unique in that their inhabitants have never spoken with the Southern regional accent, instead having their own distinct accents. /æ/ as in bad (the "default" General American nasal short-a system is in use, in which /æ/ is tensed only before /n/ or /m/). /aɪ/ as in bide (however, some Atlanta and Savannah speakers do variably show Southern /aɪ/ glide weakening). /ɔː/ as in bought (which is lowered, as in most of the U.S., and approaches [ɒː~ɑː]; the cot–caught merger is mostly at a transitional stage in these cities). Today, the accents of Atlanta, Charleston, and Savannah are most similar to Midland regional accents or at least Southeastern super-regional accents. In all three cities, some speakers (though most consistently documented in Charleston and least consistently in Savannah) demonstrate the Southeastern fronting of /oʊ/ and the status of the pin–pen merger is highly variable. Non-rhoticity (r-dropping) is now rare in these cities, yet still documented in some speakers. Most of southern Louisiana constitutes Acadiana, a cultural region dominated for hundreds of years by monolingual speakers of Cajun French, which combines elements of Acadian French with other French and Spanish words. Today, this French dialect is spoken by many older Cajun ethnic group and is said to be dying out. A related language, Louisiana Creole French, also exists. Since the early 1900s, Cajuns additionally began to develop their own vernacular dialect of English, which retains some influences and words from French, such as "cher" (dear) or "nonc" (uncle). This dialect fell out of fashion after World War II, but experienced a renewal in primarily male speakers born since the 1970s, who have been the most attracted by, and the biggest attractors for, a successful Cajun cultural renaissance. The accent includes: variable non-rhoticity (or r-dropping), high nasalization (including in vowels before nasal consonants), deletion of any word's final consonant(s) (hand becomes [hæ̃], food becomes [fuː], rent becomes [ɹɪ̃], New York becomes [nuːˈjɔə], etc. ), a potential for glide weakening in all gliding vowels (e.g. /oʊ/ (as in Joe), /eɪ/ as in jay, and /ɔɪ/ as in joy, have reduced glides: [oː], [eː], and [ɔː], respectively), and the cot–caught merger towards [ä]. One historical English dialect spoken only by those raised in the Greater New Orleans area is traditionally non-rhotic and noticeably shares more pronunciation commonalities with the New York accent than with other Southern accents. Since at least the 1980s, this local New Orleans dialect has popularly been called "Yat", from the common local greeting "Where you at?". The New York accent features shared with the Yat accent include: non-rhoticity, a short-a split system (so that bad and back, for example, have different vowels), /ɔː/ as high gliding [ɔə], /ɑːr/ as rounded [ɒː~ɔː], and the coil–curl merger (traditionally, though now in decline). Yat also lacks the typical vowel changes of the Southern Shift and the pin–pen merger that are commonly heard elsewhere throughout the South. Yat is associated with the working and lower-middle classes, though a spectrum with fewer notable Yat features is often heard the higher one's socioeconomic status; such New Orleans affluence is associated with the New Orleans Uptown and the Garden District, whose speech patterns are sometimes considered distinct from the lower-class Yat dialect. Prior to becoming a phonologically unified dialect region, the South was once home to an array of much more diverse accents at the local level. Features of the deeper interior Appalachian South largely became the basis for the newer Southern regional dialect; thus, older Southern American English primarily refers to the English spoken outside of Appalachia: the coastal and former plantation areas of the South, best documented before the Civil War, on the decline during the early 1900s, and basically non-existent in speakers born since the Civil Rights Movement. Plantation South (the Black Belt excluding the Lowcountry): phonologically characterized by /aɪ/ glide weakening, non-rhoticity (for some accents, including a coil–curl merger), and the Southern trap–bath split (a version of the trap–bath split unique to older Southern U.S. speech that causes words like lass [læs~læɛæs] not to rhyme with words like pass [pæes]). Eastern and central Virginia (often identified as the "Tidewater accent"): further characterized by Canadian raising and some vestigial resistance to the vein–vain merger. Lowcountry (of South Carolina and Georgia; often identified as the traditional "Charleston accent"): characterized by no /aɪ/ glide weakening, non-rhoticity (including the coil-curl merger), the Southern trap–bath split, Canadian raising, the cheer–chair merger, /eɪ/ pronounced as [e(ə)], and /oʊ/ pronounced as [o(ə)]. Outer Banks and Chesapeake Bay (often identified as the "Hoi Toider accent"): characterized by no /aɪ/ glide weakening (with the on-glide strongly backed, unlike any other U.S. dialect), the card–cord merger, /aʊ/ pronounced as [aʊ~äɪ], and up-gliding of pure vowels especially before /ʃ/ (making fish sound almost like feesh and ash like aysh). It is the only dialect of the older South still extant on the East Coast, due to being passed on through generations of geographically isolated islanders. Appalachian and Ozark Mountains: characterized by strong rhoticity and a tor–tore–tour merger (which still exist in that region), the Southern trap–bath split, plus the original and most advanced instances of the Southern Vowel Shift now defining the whole South. These grammatical features are characteristic of both older and newer Southern American English. Use of done as an auxiliary verb between the subject and verb in sentences conveying the past tense. I done told you before. Use of done (instead of did) as the past simple form of do, and similar uses of the past participle in place of the past simple, such as seen replacing saw as past simple form of see. I only done what you done told me. Use of other non-standard preterites, Such as drownded as the past tense of drown, knowed as past tense of know, choosed as the past tense of choose, degradated as the past tense of degrade. I knowed you for a fool soon as I seen you. Use of was in place of were, or other words regularizing the past tense of be to was. You was sittin' on that chair. Use of been instead of have been in perfect constructions. I been livin' here darn near my whole life. I might could climb to the top. I used to could do that. Use of (a-)fixin' to, or just "fixing to" in more modern Southern, to indicate immediate future action in place of intending to, preparing to, or about to. They're fixing to go for a hike. Preservation of older English me, him, etc. as reflexive datives. I'm fixin' to paint me a picture. He's gonna catch him a big one. Saying this here in place of this or this one, and that there in place of that or that one. This here's mine and that there is yours. Existential It, a feature dating from Middle English which can be explained as substituting it for there when there refers to no physical location, but only to the existence of something. It's one lady that lives in town. Use of ever in place of every. Ever'where's the same these days. Use of "over yonder" in place of "over there" or "in or at that indicated place", especially to refer to a particularly different spot, such as in "the house over yonder". Additionally, "yonder" tends to refer to a third, larger degree of distance beyond both "here" and "there", indicating that something is a longer way away, and to a lesser extent, in a wide or loosely defined expanse, as in the church hymn "When the Roll Is Called Up Yonder". Ain't to mean am not, is not, are not, have not, has not, etc. Unique words can occur as Southern nonstandard past-tense forms of verbs, particularly in the Southern highlands and Piney Woods, as in yesterday they riz up, come outside, drawed, and drownded, as well as participle forms like they have took it, rode it, blowed it up, and swimmed away. Drug is traditionally both the past tense and participle form of the verb drag. Frequency of either "Y'all" or "You all" to address multiple people, according to an Internet survey of American dialect variation. Frequency of just "Y'all" to address multiple people, according to an Internet survey of American dialect variation. Y'all is a second person plural pronoun and the usual Southern plural form of the word you. It is originally a contraction – you all – which is used less frequently. This term originated with the modern Southern dialect region and is not found in older Southern dialects. When addressing a group, y'all is general (I know y'all) and is used to address the group as a whole, whereas all y'all is used to emphasize specificity of each and every member of the group ("I know all y'all.") The possessive form of Y'all is created by adding the standard "-'s". Y'all is distinctly separate from the singular you. The statement "I gave y'all my truck payment last week," is more precise than "I gave you my truck payment last week." You (if interpreted as singular) could imply the payment was given directly to the person being spoken to – when that may not be the case. "All y'all" is used to specify that all members of the second person plural (i.e., all persons currently being addressed and/or all members of a group represented by an addressee) are included; that is, it operates in contradistinction to "some of y'all", thereby functioning similarly to "all of you" in standard English. In rural southern Appalachia an "n" is added to pronouns indicating "one" "his'n" "his one" "her'n" "her one" "Yor'n" "your one" i.e. "his, hers and yours". Another example is yernses. It may be substituted for the 2nd person plural possessive yours. Southern Louisiana English especially is known for some unique vocabulary: long sandwiches are often called poor boys or po' boys, woodlice/roly-polies called doodle bugs, the end of a bread loaf called a nose, pedestrian islands and median strips alike called neutral ground, and sidewalks called banquettes. Discussion of "Southern dialect" in the United States popularly refers to those English varieties spoken by white Southerners; however, as a geographic term, it may also encompass the dialects developed among other social or ethnic groups in the South, most prominently including African Americans. Today, African-American Vernacular English (AAVE) is a fairly unified variety of English spoken by working- and middle-class African Americans throughout the United States. AAVE exhibits an evident relationship with both older and newer Southern dialects, though the exact nature of this relationship is poorly understood. It is clear that AAVE was influenced by older speech patterns of the Southern United States, where Africans and African Americans were held as slaves until the American Civil War. These slaves originally spoke a diversity of indigenous African languages but picked up English to communicate with one another, their white masters, and the white servants and laborers they often closely worked alongside. Many features of AAVE suggest that it largely developed from nonstandard dialects of colonial English (with some features of AAVE absent from other modern American dialects, yet still existing in certain modern British dialects). However, there is also evidence of the influence of West African languages on AAE vocabulary and grammar. It is uncertain to what extent early white Southern English borrowed elements from early African-American Vernacular English versus the other way around. Like many white accents of English once spoken in Southern plantation areas—namely, the Lowcountry, Virginia Piedmont and Tidewater, lower Mississippi Valley, and western Black Belt—the modern-day AAVE accent is mostly non-rhotic (or "r-dropping" ). The presence of non-rhoticity in both black English and older white Southern English is not merely coincidence, though, again, which dialect influenced which is unknown. It is better documented, however, that white Southerners borrowed some morphological processes from black Southerners. Many grammatical features were used alike by older speakers of white Southern English and African-American Vernacular English more so than by contemporary speakers of the same two varieties. Even so, contemporary speakers of both continue to share these unique grammatical features: "existential it", the word y'all, double negatives, was to mean were, deletion of had and have, them to mean those, the term fixin' to, stressing the first syllable of words like hotel or guitar, and many others. Both dialects also continue to share these same pronunciation features: /ɪ/ tensing, /ʌ/ raising, upgliding /ɔː/, the pin–pen merger, and the most defining sound of the current Southern accent (though rarely documented in older Southern accents): the glide weakening of /aɪ/. However, while this glide weakening has triggered among white Southerners a complicated "Southern Vowel Shift", black speakers in the South and elsewhere on the other hand are "not participating or barely participating" in much of this shift. AAVE speakers also do not front the vowel starting positions of /oʊ/ and /uː/, thus aligning these characteristics more with the speech of nineteenth-century white Southerners than twentieth-century white Southerners. One strong possibility for the divergence of black American English and white Southern American English (i.e., the disappearance of older Southern American English) is that the civil rights struggles caused these two racial groups "to stigmatize linguistic variables associated with the other group". This may explain some of the differences outlined above, including why all traditionally non-rhotic white Southern accents have shifted to now becoming intensely rhotic. 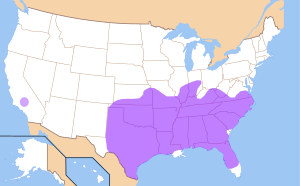 In the United States, there is a general negative stigma surrounding the Southern dialect. Non-Southern Americans tend to associate a Southern accent with cognitive and verbal slowness, lack of education, ignorance, bigotry, or religious and political conservatism, using common labels like "hick", "hillbilly", or "redneck" accent. The accent is also associated nationwide with the military, NASCAR, and country music; in fact, even non-Southern American country singers typically imitate a Southern accent in their music. Meanwhile, Southerners themselves tend to have mixed judgments of their own accent, some similarly negative but others positively associating it with a laid-back, plain, or humble attitude. The sum negative associations nationwide, however, are the main presumable cause of a gradual decline of Southern accent features, since the middle of the twentieth century onwards, among younger and more urban residents of the South. ^ Clopper, Cynthia G; Pisoni, David B (2006). "The Nationwide Speech Project: A new corpus of American English dialects". Speech communication vol. 48,6: 633-644. ^ Map from the Telsur Project. Retrieved 2009-08-03. ^ "ASA 147th Meeting Lay Language Papers - The Nationwide Speech Project". Acoustics.org. 2004-05-27. Archived from the original on 2014-01-08. Retrieved 2012-11-08. ^ A Handbook of Varieties of English: Volume 1, p. 332. ^ Hayes, Dean (2013). "The Southern Accent and 'Bad English': A Comparative Perceptual Study of the Conceptual Network between Southern Linguistic Features and Identity". UNM Digital Repository: Electronic Theses and Dissertations. p. 63. ^ A Handbook of Varieties of English: Volume 1, p. 331. ^ Wells, John C. (1988). Accents of English 1: An Introduction. Cambridge University Press. p. 165. ^ American Varieties: Texan English. Public Broadcasting Service. MacNeil/Lehrer Productions. 2005. ^ a b Dubois, Sylvia and Barbara Horvath (2004). "Cajun Vernacular English: phonology." In Bernd Kortmann and Edgar W. Schneider (Ed). A Handbook of Varieties of English: A Multimedia Reference Tool. New York: Mouton de Gruyter. p. 412-4. ^ a b c d Dubois, Sylvia and Barbara Horvath (2004). "Cajun Vernacular English: phonology." In Bernd Kortmann and Edgar W. Schneider (ed). A Handbook of Varieties of English: A Multimedia Reference Tool. New York: Mouton de Gruyter. p. 409-10. ^ Alvarez, Louis (director) (1985). Yeah You Rite! (Short documentary film). USA: Center for New American Media. ^ a b c d e Algeo, John (ed.) (2001). The Cambridge History of the English Language, Volume 3; Volume 6. Cambridge University Press. pp. 275-277. ^ "Carry". The American Heritage Dictionary of the English Language, Fifth Edition. 2017. Houghton Mifflin Harcourt Publishing Company. ^ "Liketa". Yale Grammatical Diversity Project. Yale University. 2018. ^ a b c Dictionary.com. Dictionary.com Unabridged, based on the Random House Dictionary. Random House, Inc. 2017. ^ Berrey, Lester V. (1940). "Southern Mountain Dialect". American Speech, vol. 15, no. 1. p. 47. ^ "Right". The American Heritage Dictionary of the English Language, Fifth Edition. 2017. Houghton Mifflin Harcourt Publishing Company. ^ "Reckon". The American Heritage Dictionary of the English Language, Fifth Edition. 2017. Houghton Mifflin Harcourt Publishing Company. ^ a b "Dialect Survey Results". www4.uwm.edu. ^ "Harvard Dialect Survey - word use: a group of two or more people". ^ "banquette". The American Heritage Dictionary of the English Language: Fourth Edition. 2000. Retrieved 2008-09-15. ^ Lanehart, Sonja L. (editor) (2001). Sociocultural and Historical Contexts of African American English. John Benjamins Publishing. pp. 113-114. ^ Hayes, Dean (2013). "The Southern Accent and 'Bad English': A Comparative Perceptual Study of the Conceptual Network between Southern Linguistic Features and Identity". UNM Digital Repository: Electronic Theses and Dissertations. p. vi. ^ a b Fought, John G. (2005). "American Varieties: R-ful Southern". Do You Speak American? MacNeil/Lehrer Productions. ^ Hayes, 2013, p. 39. Bernstein, Cynthia (2003). "Grammatical features of southern speech". In Stephen J. Nagel; Sara L. Sanders (eds.). English in the Southern United States. Cambridge: Cambridge University Press. ISBN 978-0-521-82264-0. Crystal, David (2000). The Cambridge Encyclopedia of the English language. Cambridge: Cambridge University Press. ISBN 978-0-521-82348-7. Cukor-Avila, Patricia (2003). "The complex grammatical history of African-American and white vernaculars in the South". In In Stephen J. Nagel and Sara L. Sanders (ed.). English in the Southern United States. Cambridge: Cambridge University Press. ISBN 978-0-521-82264-0. Hazen, Kirk & Fluharty, Ellen (2004). "Defining Appalachian English". In Bender, Margaret (ed.). Linguistic Diversity in the South. Athens: University of Georgia Press. ISBN 978-0-8203-2586-6. Beard, Robert. "Southernese". Glossary of Southernisms. "Southern Accent Tutorial, with Voices of Native Speakers". A Site About Nothing. "Southern Fried Vocab No. 10". Smarty's World. February 12, 2010. Guy, Yvette Richardson (Jan 22, 2010). "Great day, the things that grandparents say". The Post and Courier.